In 1938 Mathew A. Thomson Sr. purchased land on Los Carneros Avenue at a property tax auction. He, along with his son, Matthew A.Thomson Jr. farmed the land (pears, apples, and prunes) under the name “M.A. Thomson” until 1965 when M.A. Thomson was the last grower to have a pear contract in Napa County with California Canners and Growers. In 1950 M.A. Thomson received a federal soil conservation grant to build the Carneros Creek flashboard dam and later in 1955 to build a 20 acre foot reservoir to irrigate the land. At just 12 years old and the oldest of five siblings, George A. Thomson was responsible for the spraying, spray reports, cultivation, irrigation and delivery of fruit. At that time harvest lasted 10 days and George was tasked to deliver 10 ton of fruit every day for 10 days during harvest to the Southern Pacific Railroad station, what is now the intersection of Trancas and Redwood Road in Napa Valley. The fruit was shipped across California by railway. Because of his irrigation knowledge George went to work for Rene di Rosa when he was a junior in high school. He was in charge of irrigation, rootstock and grafting for the de Rosa vineyards through his graduation from Sonoma State University. In 1970 M.A. 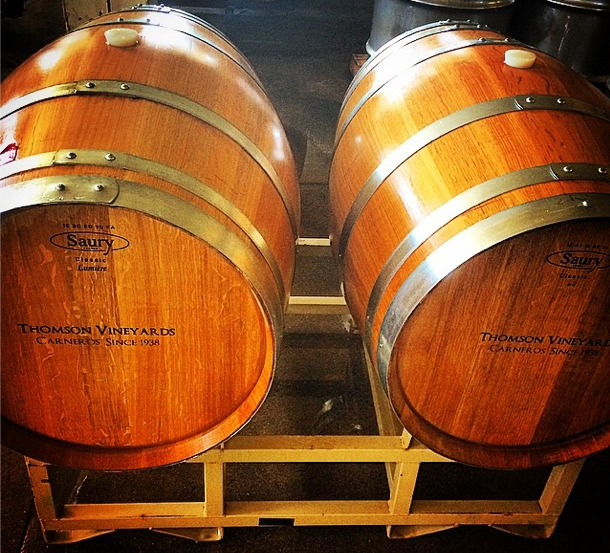 Thomson family members began planting 50 acres of dry farmed vineyards on Cuttings Wharf Road, 30 acres on Los Carneros followed and because of the designated water rights Thomson Vineyards were the first irrigated vineyards in Los Carneros. Matthew A. Thomson Jr., Mason Iund and Abbott Williams planted the land with a combination of Pinot Noir and Chardonnay. Matthew A. Thomson Jr., in his late seventies, transferred the responsibility of M.A. Thomson on his sons George and Matt Thomson in early 2000. Two acres of Merlot were planted on Monticello Road in the late 1990s. Between 2000 and 2011 George, “The Farmer” was solely responsible for the vineyards at Los Carneros Avenue and Monticello Road and often lent farming and harvest help to step-brother David Iund at Iund Vineyards. In 2009 George’s oldest daughter Jennifer R. Thomson began her apprenticeship harvesting and hauling fruit for George and David. Picking what George calls, “the absolute worst time to get into farming” Jennifer single-handedly managed the 2011 harvest known by wine critics and industry insiders as the most challenging vintage in Napa Valley since 1998. By 2012 Jennifer had taken over full operation of both the Los Carneros Avenue Vineyard and George’s Monticello Road Vineyard. Just as her father and grandfather have done before her, she lends support to David at his Cuttings Wharf Vineyard. Awarded the Huevos Badge on December 11, 2010 by the Vinotology Wine Blog for writing some of the ballsiest blog posts in the wine industry, Jennifer’s blogging (among other things) has taken a back seat while she rejuvenates old systems and infrastructure, updates equipment, turns water into wine and swaps between boots and heels in the vineyard and California wine scene. She holds a Bachelor of Science (BS) degree in Communications from Cal Poly, San Luis Obispo and a Master of Business Administration (MBA). Her thesis is titled The Economic Climate of the California Wine Industry. Jennifer is dedicated to the legacy of farming premium winegrapes in the Napa Valley just as the three previous generations have done before her. Read more in the Napa Grapegrowers Fall 2009 edition of Premium Grower.